The auspicious hill Sri Vijaya Ki:la:dri is situated in Andhra Pradesh Guntur, behind JET’s Vedic University on the banks of Krishna River. This divine hill “Adrira:jam” is an abode to all Gods and specifically is the place where Arjuna performed penance. It is surrounded by waters of River Krishna on all three sides. The sacred hills possess great importance and radiate spectacularly with the waves of the Krishna River rippling over the shores. According to science of Va:astu, if there is a water body to the North of any place, then it brings immense good fortune. Tirumala has the ‘Pushkarini’ to the North of its main temple and Sri Rangam has the River Cauvery flowing on all three sides of its temple. Likewise, the Ki:la:dri hills , is surrounded by River Krishna on its three sides. The Va:stu Science has predicted that, due to such favorably placed water bodies, the auspicious hills Vijaya Ki:la:dri shall bring great welfare and prosperity to the entire state and country – just like Sri Rangam and Tirumala. Many people in the past have unsuccessfully tried to construct a temple on the hills. On one occasion, in 1965, Sri Pedda Jeeyar Swamiji happened to visit this place. At that time, the committee members of Vijaya Ki:la:dri, met Sri Pedda Swamiji and expressed their intentions for a temple. Sri Pedda Jeeyar Swamiji too glorified the greatness of these magnificent hills and appreciated their idea for a big temple on the hill. Soon a path was laid to the top of the hill with 360 broad rock-made steps. And much later, a temple was finally constructed under the guidance of Sri Chinna Jeeyar Swamiji. How this enormous task took its shape to completion, has been elaborated by Sri Chinna Jeeyar Swamiji in HH own words. Our scriptures say that “If the intentions are good and pure, things will fall in place easily and systematically on its own”. Pedda Jeeyar Swamiji wished for a temple some ~60 years back. Sri Pedda Jeeyar Swamiji is hailed by many prominent contemporary scholars, Jeeyars and even by the most eminent Prativadi Bhayankara Anangaracharya as being a “Satya Sankalpa” – meaning a person with extraordinary pure intentions that always turn true! Only God in Vaikunttam is praised as ‘Satya Sankalapa’. Sometimes, very great divine people who leave the Earth, too attain such an honorable title. “But Sri Pedda Jeeyar Swamiji has been praised as ‘Satya Sankalapa’ while He was still living” – wrote Sri Annagaracharya Swamy in one of his works. Sri Pedda Swamiji envisioned a Sri Venkateshwara Swamy temple on the hill. And for that reason, he got a temporary temple (called Ba:la:layam) erected. As days passed by, there was not much progress in the temple development, because Sri Pedda Swamiji became extremely busy with Sri Ra:ma Maha Krathuvu programs, Ve:da Krathuvu, new temples’ consecrations etc. HH Pedda Swamy just could not spare any time for the construction of the temple! “If such great people like Pedda Swamy have intended for something, then it becomes the responsibility of his followers to fulfill it” – said Sri Chinna Jeeyar Swamiji. So how it took shape? The temple is the pure intention of Pedda Swamiji. For a while, Sri Chinna Jeeyar Swamiji did not approach anyone to talk about the temple. But once, a person Sri A:njane:yulu visited Sri Chinna Jeeyar Swamiji, to talk about the temple. Before a temple could be constructed, HH felt that a road way was inevitable to reach the top of the hill. Hence, HH handed over that task to two dedicated persons – Sriman Chakradhar and Sriman Basaveshwar. They indeed proved their mettle by successfully getting the pathway completed! The hill is after all “Vijaya Ki:la:dri” – No wonder they achieved ‘Vijayam’ – Victory. After the road was laid, the focus shifted to the construction of the temple. Sriman Granthi Lakshmi Kantarao, son of Sriman Granthi Subbarao became a very active participant in construction of the temple on Vijaya Kiladri. When his son Sriman Granthi Lakshmi Kantarao took over his father’s job, he involved many of his friends into the divine cause of building the temple. Finally a marvelous group of 9 temples got constructed with the cooperation of several other people like Sriman Mukkamala Apparao, M.P Sriman Gokaraju Gangaraju, the couple Sriman Leela Chakradhar & Radhika, Sriman Devaboyina Pandu Ranga Rao, the couple Lakshmi Sarada and so many others. The temples were inaugurated in all its grandeur in 2017 by Sri Chinnajeeyar Swamiji. In general, hills and mountains always remain very attractive and it captivates people! There are people who trek hills for its beauty. There are others who climb hills to see and experience God. Once, not long before this temple was completed, a devotee who intended to see the Lord, climbed up the Ki:la:dri hills. Since the steps were already laid by then, he found it quite comfortable to reach the top. He wanted to do some meditation on the hills. He strolled around the place to find a suitable seat. He saw a rocky mud pile and thought it was a good one for his prayers. He began to clean the place a bit and was suddenly taken aback at what he saw. He started to sweat and he swiftly cleaned the place a little more. As he was clearing the mud, he was astonished to find a crown – a stone-made crown protruding from the mound! Bewildered and terrified, he immediately climbed down the hills and sped towards the Ashramam situated at the foothills. He hurried into the Ashramam to meet Sri Chinna Jeeyar Swamiji but ran into Sri Ahobila Jeeyar Swamiji, who was there at that time. When Sri Ahobila Jeeyar Swamiji learnt about his discovery, he was very amazed. HH, along with some Vedic students, together began climbing the ‘Vijaya Ki:la:dri’ hills. The climb felt extremely tiring due to lot of thorny bushes and shrubs all along the rocky steps. The students cleared the way all along by plucking away the thorns and bushes. Finally, they reached the top of the hills at 5.00 PM – very exhausted. The mendicant took all of them to the place where he saw the crown. Seeing the crown top, everyone was extremely thrilled and excited. They cleared the mud further to find a beautiful idol of Sri Hanuman! Sri Ahobila Swamiji was simply overjoyed to find Lord A:njane:ya Swamy. HH had been doing ‘Sundara Ka:nda Pa:ra:yanam’ all the while and his happiness knew no bounds at the appearance of the statue of Hanuman who happens to be HH’s favorite God. He immediately informed Sri Chinna Jeeyar Swamiji and per HH Chinna Jeeyar Swamiji’s instructions, the idol was rightly consecrated with rituals. The press soon came to know about this discovery, and reached out to Sri Ahobila Swamiji for more information. Ahobilam Swamiji began to describe the events and very ingeniously said that, since Hanuman appeared, the hill can be called ‘Anjana:dri’ and since there is a huge anthill beside it, it can be also be called ‘Seshadri’. These are the hills where Lord Indra performed penance in the North side. Hence these hills are also called ‘Indra:dri’ and with Arjuna (aka as Vijaya) too performing penance here this is ‘Vijaya Ki:la:dri’. This place having become significant for its various kinds of ‘hills’ can be aptly called as ‘Vijaya Ki:la:dri’ ! At that time, Sri Ahobila Swamiji had also described the hills as being surrounded by the glorious river Krishna flowing on its 3 sides. During the Mahabharat War, Hanuman was represented as an emblem on the Flag post of Arjuna’s chariot. And since Arjuna was going to win the war with Hanuman’s protection ‘flagging’ over his chariot, he attained the name ‘Vijaya’. And besides, Arjuna performed penance on this hill to obtain boons from divinity for the impending war. Given such historical significance, the appearance of Hanuman on ‘Vijaya Ki:la:dri’ hills, as the Kshetra Pa:laka (Protector of the place) is indeed extraordinary! Since the discovery of Hanuman idol on the hills, the members, organized bhajans programs every Tuesday. Sriman Madhusudhanacharya Swamy and Sriman Venkatacharya Swamy used to take the Vedic students up the hill everyday and they all worked very hard to create a beautiful place around, by clearing several weeds, thorny bushes and plants. Sri Ahobila Swamiji too used to go up the hill continuously for several days to guide them in their efforts. By the end of the day the students always rendered Ve:dic chants for a while before returning to the Ashramam. Soon the construction picked pace for not one temple but 9 prominent temples. Sriman Granthi Kantharao, son of the Granthi Subbarao (CEO of Betul Nut Industries), actively took part in the temple development. He got Sri Sri Sri Chinnajeeyar Swamiji to lay the foundation on 21st Dec 2015. Finally, the 9 temples successfully took shape with few other donors funding the project. It happened purely due to the motivation and the divine ‘Sankalpam’ of Pedda Jeeyar Swamiji. The temples’ inauguration ceremony began on Feb 1 2017. Many Ve:dic Pandits, Jeeyars, and Pi:tta:dhipathis (Heads of Monasteries) were invited for the event. Vikasatarangini members and students from Vijayawada/Guntur too participated in the grand event. Sriman Sitarama Swamy – Head of Mumukshujana Peettam, Peddamukteevi. Sriman U.Ve. Udaiyvar Swamy from Vijayawada. Hundreds of devotees thronged the hills and offered their services and prayers. 16 free buses were arranged for the devotees to easily travel up the hill. On the first day Sri Ahhobima Jeeyar Swamiji performed ‘Nadi Puja’ (The ritual worship of the river Krishna), And the holy waters were used for the temple sampro:kshanam (Customary temple cleaning & purification ritual). HH then performed Go:puja (Worship of the cows), Vishwakse:na puja (Worship of Viswakse:na). These rituals were excellently carried out by Sriman Yajnacharya, Sriman Samudrala Srinivasacharyulu, Sriman Mudumbai Madhusudanacharya & his team. In the evening, the main deities along with the Utsava Mu:rthis, took a grand procession around the hills through the surrounding villages. Several people gathered to see the beautiful Gods. The entire village adorned a festive look with devotees dancing, singing and playing instruments. Sri Sri Sri Chinnajeeyar Swamiji too took part in the celebrations. HH stayed on the hills all the 5 days and the grandiose of the festival was such that it felt like there was a huge city atop the hills! 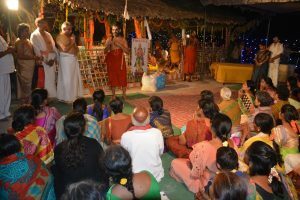 HH conducted the ankura:rpanam and ‘adhiva:sa’ ritual for all the 9 temples systematically without deviation, although it was a difficult task, to do for all the temples in one go! It was an auspicious day of Ratha Saptami. HH Swamiji gave an excellent speech on the importance of the day. HH described the greatness of the Sun and the significance of the most divine sloka – Aditya Hrudyam- Ra:mayanam says that Sri Rama attained victory over Ravana after chanting Aditya Hrudayam. HH then made everyone repeat the slokas and explained its meaning word-word. Devotees participated in the recitation of Adityahrudayam with enthusiasm and devotion. Later in the day, several other ritualistic ceremonies related to temples, were conducted. That day, also happened to be the day when Sri Ahobila Jeeyar Swamiji took Sanya:sashramam some 12 years back. So, Sri Chinnajeeyar Swamiji honored Ahobila Swamiji with blessings, flowers and lots of appreciations. On day 4, Andhra Pradesh Health Minister Sriman Kamineni Srinivas attended the event along with his family. Later in the day, Sriman Yajnacharyula Swamy performed the Abhishe:kam ritual for the main deities and HH did the Abhimantra ritual for all 50 idols in the temples. Sri Swamiji then gave a lecture on the importance of chanting of the holy names of God. HH also explained about the adhiva:sa rite. It is a ritual which describes the God in the idol form. “And in order to tell about the condition of the idols, all the related rituals of adhiva:sa should be done” -said Sri Swamiji. The day began with Vedic chanting. Ex MP Sriman Lagadapati Rajagopal visited the event and took the blessings of HH. Later Sriman Granthi Kantha Rao, Sriman Gokaraju Gangaraju, Sriman Ramesh Guptha, Sriman Mukkamala Apparao, shared about their experiences with Sri Swamiji. In the evening, devotees chanted Sri Vishnu Sahasrana:mam stho:thram and later some rituals were performed where ‘Yanthras’ were placed in all the temples, followed by Bimba-stha:pana ritual. On the eve of the new beginning of Vijaya Ki:la:dri temples, Sri Swamiji made an announcement. The service of food distribution must be done to all the devotees and followers of other faiths/philosophies at their residing places itself. If required, all the necessary provisions, and funds must be supplied for their convenience. Later that day, Lord’s ‘se:sha vasthram’ (clothes that adorn the deities once) were sent to Vijaya Durgamma temple, Sri Mangalagiri Narasimha Swamy temple, A:njane:ya Swamy temple, and a nearby Siva temple. This was the most important day of the event. The day began with ‘Tirtha Goshti’ program in the presence of Sri Sri Sri Chinna Jeeyar Swamiji, Sri Ahobila Jeeyar Swamiji, Sri Devanath Jeeyar Swamiji, Sri Sattagopa Jeeyar Swamy, Srivilliputthur Jeeyar Swamy, Sri Sri Vrathadhar Jeeyar Swamiji, Sri Sri Sri Sriramachandra Jeeyar Swamiji. After Ti:rtha Goshti, several other rituals were performed in the temple premises. It was a feast to the eyes to watch the programs being conducted in different temples by all the Jeeyars! These magnificent, splendorous group of temples would not have been possible without the donors pouring in their funds in various forms. The funds together with the devotional services rendered by hundreds of devotees for the temple construction guided by HH Sri Swamiji and other Jeeyars is the reason for the successful construction of the temples per the wish of Pedda Jeeyar Swamiji! It is indeed our good fortune that we have the most auspicious hills located in our presence where Lord has decided to dwell in several forms as deities in the temples atop the divine hills. There are a source of prosperity and salvation. Come! Let’s worship the Lord residing on ‘Vijaya Ki:la:dri’ hills in all his Glory.